This fall we will have two new television shows that perpetuate the ideas about interstellar travel that we saw in the Star Trek movies and television series. The first is a comedy-drama TV show called The Orville starring Seth MacFarlane, which has been described as a Star Trek clone. The second is a new CBS series called Star Trek: Discovery, which is yet another incarnation of Star Trek, following in the footsteps of the original TV series, Star Trek: The New Generation, Star Trek: Voyager, Star Trek: Enterprise, and Star Trek: Deep Space Nine. So far I have enjoyed The Orville, which seems to be striking a nice balance between drama and comedy. As someone who has spent endless hours watching three previous Star Trek television series, I was greatly anticipating the first episode of Star Trek: Discovery. But the episode slightly disappointed me, despite impressive production values. Besides the distracting uniforms (with golden sides that reflect light in a glaring way), there was the issue of the trigger-happy first officer (Burnham). In the show she recommends an unprovoked attack against the Klingons, on the weak grounds that long ago some of them killed some Vulcans. The show may be trying to make the female first officer look like a real macho man-lady, but so far the show has failed to create a character we can morally respect. Interstellar travel will be very fast, because ships will be able to use warp drives that allow spaceships to travel between stars in a matter of days, or hyperspace jumps that allow spaceships to instantaneously travel between stars. When an interstellar spaceship gets to a planet revolving around another star, the main activity of the crew will be to interact with or study the life forms that exist on the planet. Interstellar spaceships will be very heavily loaded with weapon systems and defensive shielding systems, to protect themselves against hostile spaceships that may be encountered in a star system. Pretty much the only earthly life forms on the spaceship will be humans. There will be no real vegetation, and no horses, birds or dogs anywhere (except those that appear in a holographic illusion system called the holodeck). The spaceships that travel between stars will be rather cramped, and living on them will be rather like living in a submarine, except for those lucky enough to enjoy the holographic illusion system called the holodeck. But there are reasons for thinking that such assumptions are totally wrong, and that interstellar spaceships and their activities will be completely different from what we see in Star Trek and Star Wars. The first reason has to do with the speed of interstellar travel. The nearest star is about 4 light-years away. A light-year is the time it takes for light to travel a year. Einstein's Special Theory of Relativity tells us that the speed of light is an absolute speed limit that cannot be violated. It is barely possible that there are currently undiscovered laws of nature or facets of nature that might allow us to side-step such a limitation, and travel to a distant star much faster, perhaps instantly. But such a possibility is a mere speculation, and there is currently no evidence for it. Given the speed limit of the speed of light, an average distance between stars of about 4 light years, and the engineering difficulties of even reaching half of the speed of light (and the need to slowly accelerate and slowly decelerate), the average interstellar voyage will probably take decades. There is also strong reason to suspect that once a spaceship reaches another solar system, it will be nothing like what happens on Star Trek or Star Wars. This is because there is strong reason to suspect that life in the universe may be rare, in the sense that the vast majority of planets do not have life, even if the planets are a suitable distance from the star they orbit. The problem is that even the simplest form of life apparently needs to be an incredibly complex system, one that seems to be fantastically improbable to appear by chance. See here for some of the reasons for thinking that life originating by chance is harder than water-tight log cabins accidentally forming by falling trees. Captain Kirk: Mister Sulu, put us in orbit around the planet. Spock, what do your sensors pick up in regard to life forms? Spock: Nothing, Captain. Nothing at all. The planet is completely sterile. Captain Kirk: You mean we came all the way over here for nothing? But there are strong reasons for suspecting that this is just what would be likely to happen to an interstellar mission arriving in a distant solar system. Unless there is something special going on to increase the odds (some cosmic teleology or some cosmic life-force), the odds are stacked very strongly against us finding life in a particular solar system that we might explore. No weapons systems, and no defensive systems, because the odds of encountering a threatening presence may be too small. 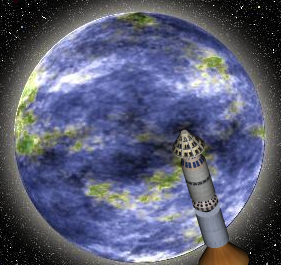 The ship may be a miniature worldlet, capable of supporting a complex ecosystem. The ship may be designed for multiple generations to live in. There will be huge areas filled with plant life and various forms of life. The ship may be something like a Noah's Ark, containing hundreds or thousands of examples of earthly life, including animals such as dogs, horses, cows, birds, lions, bears, dolphins, and fish. When the interstellar spaceship arrives at a planet arriving around a distant star, the plan may be to terraform a planet that will probably be lifeless. This will be a slow process that may take centuries. First, microorganisms would be introduced on the planet, microbes that would be designed to give off oxygen. After many decades the planet would have a breathable atmosphere. Then various plant forms could be introduced. Finally various forms of animal life could be introduced, starting with small animals, and gradually working up to larger animals. The interstellar spaceship would need to be a multi-generation ship because the terraforming process might take centuries. For the crew members, it might be frustrating. 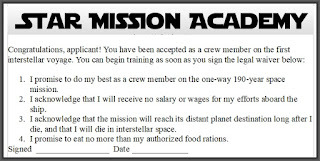 The initial crew members who left Earth on the interstellar voyage might live the rest of their lives on the spaceship, dying of old age before the ship ever reached another star. 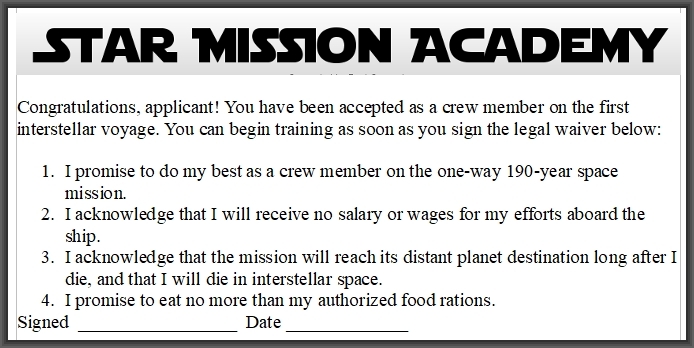 Or, if a crew member lived to see the arrival of the ship at a distant solar system, the crew member might never walk on a planet of that solar system. If it took centuries to terraform the planet, that crew member might have to be satisfied with watching the planet in orbit, as it slowly got a little bit greener every year. If it turns out that interstellar missions work completely different from what we saw in Star Trek, we should hardly be surprised. Star Trek was a great show, but it did have its realism problems. I've seen all episodes of the original series several different times, and can never recall one time when the crew members either wore a jacket or rolled up their sleeves when exploring distant planets. But such planets would have had random conditions, with some being much colder than Earth, and some being much hotter. While I was writing this post, I watched an old episode of Star Trek in which Mr. Scott tells Captain Kirk that pressing a red button on a panel will blow up the spaceship they are on. But the red button didn't even have any marking next to it indicating what it did. So Star Trek had realism problems from its beginning, and we shouldn't use it as a realistic model for interstellar exploration.